Following the end of the 2013 season, there was something of an earthquake in the National Lacrosse League's coaching fraternity. It involved a well-respected coach who was a member of the 1993 Buffalo Bandits team that had a perfect season. The center of the shakes was in Toronto, where the Rock surprised practically everyone. Troy Cordingley was shown the door by the team on May 31, in spite of a first-place finish in the NLL East. The departure came just after Cordingley had been selected as the league's coach of the year. Assistant coach John Lovell was promoted to replace him. The Rock had won the championship under Cordingley in 2011 and reached the championship game in 2010. There was talk that Cordingley had "lost" the locker room, whatever that meant. There wasn't much of a sign of it on the field until the playoffs. Certainly Steve Dietrich was paying attention to that news out of Toronto. While no one was aware of it at the time, the Buffalo Bandits' general manager had coaching matters on his mind too. He and other members of the front office were trying to decide whether to keep Darris Kilgour in that job. Kilgour had become part of the furniture in Buffalo lacrosse, first as a player and then as coach starting in 2003. Kilgour also had been general manager until he lost those duties before the 2013 season. When the Bandits missed the playoffs on the final day of the 2013 season, many wondered if Kilgour's job was safe. As the weeks went by, Kilgour's job seemed to be getting more secure by the hour. Therefore, it was another thunderbolt when on June 10, the Bandits announced that had relieved Kilgour of his duties. It's fair to say that this was a unique event in Buffalo sports history. Usually coaches and executives depart with a quick public statement that's on the vanilla side - if at all. Not only did everyone involved have something to say, but Kilgour made the most memorable exit speech in Buffalo sports history. "I have no feelings toward the team right now. The last thing I said to them is to take my number out of the rafters. I don’t want anything to do with them," he said. Once the shock of all that wore off, the usual guessing game began about a successor began. It began with Cordingley, since Dietrich had been an assistant coach under Cordingley in Toronto. However, the team did go through the process of putting out the "help wanted" sign to see who might be interested. The Bandits reportedly narrowed the field of candidates down to four: Cordingley, assistant coaches Dan Teat and Rich Kilgour, and Colorado assistant Ed Comeau. But Cordingley was always the favorite. On July 3, he was named to the position. The connection between the two men was so strong that Dietrich had to erase a possible impression that Kilgour was fired only because Cordingley had become available. "We thought it needed a new voice," Dietrich said about the team. "We were in the process of putting together a list of names. When we heard the unfortunate news about Troy, he was another name on the list. This process was well underway. It was going to happen no matter who was available." "It's been a ride for the last four or five weeks, but I can't tell you how exciting it is to be back in Banditland," Cordingley said upon arrival. The next order of business was to select the major assistant coaches, and Cordingley had something of a surprise in store there. He brought back both Kilgour and Teat. Kilgour's return probably was the bigger surprise, since his brother had just exited. But if he wanted to stay in coaching in the National Lacrosse League, this was the best option for him. "I held nothing against Troy," Kilgour said. "We threw our names in the net and they picked him. I don't think he back-stabbed anyone. He's got Cups on his resume. There were no hard feelings. ... If it hadn't been Troy, who knows if I'd be here? ... We know each other. We have similar views." It didn't take long for Dietrich to get to work for the upcoming season. His first move was a stunner, getting Ryan Benesch and Andrew Watt from Minnesota for two first-round picks and a third-rounder later in July. Benesch was one of the league's top offensive players, and Watt was a good transition player. Still, it certainly was a deal that meant the Bandits were giving up some of their future for a better present, and there had been a lot of that in recent years. It's hard to know if the swap was a reaction to missing the playoffs in the previous year. After all, the Bandits certainly would see a good-sized drop in attendance unless moves were made and the team won some games. Soon after that, Dietrich added another veteran. Defender Rory Smith and a low pick came over from Colorado for Carter Bender and two future second-rounders. Smith was known as one of the toughest players in the league, and the Bandits suddenly had a defense (Smith, Billy Dee Smith, Derek Suddons, Steve Priolo) that could make life miserable for any offense. Buffalo took August off and then completed more details as the draft approached in September. Luke Wiles was shipped to Philadelphia for a pair of second-round picks. Wiles had a great first year in Buffalo, but slumped badly in 2013 and had fallen off the roster at one point. There was a feeling he had worn out his welcome, so it wasn't a surprise to see him go. On draft day, Dietrich used his resources superbly in acquiring Joe Resetarits from Calgary. The forward not only was a first-round pick of the Roughnecks the year before, but he was from Western New York. He and a second-rounder came to Buffalo for two second-round choices. Mitch Jones was acquired from Vancouver (freshly moved from Washington) for two second-rounders. We can only hope the league was able to keep track of where the Bandits' second-round picks for the next few years had landed when all was said and done. There was one other roster spot opening for training camp, as Alex Kehoh Hill took the year off. That sounded like a great deal of activity, but in reality there wasn't much turnover as the new season approached. The new collective bargaining agreement lowered the number of players to 20, with 18 dressing on a given night. After a year of "creative tension" with too many players for too few roster spots, the lineup required little tinkering throughout the season. John Tavares did indeed return for another season at the age of 45, although some wondered about that when he took the summer off. Cordingley's biggest contribution might have been to move Mark Steenhuis back to forward after he been on transition for the most part for the previous few years. Moving a 50-goal scorer to that role was like asking Albert Pujols to bunt. "Yes, I was absolutely confused," Steenhuis said about the position move. "It's been a super-weird three years for me. ... I couldn't tell you why it happened. It was like a bomb blew up." The league expanded the schedule again, moving to 18 games from 16. 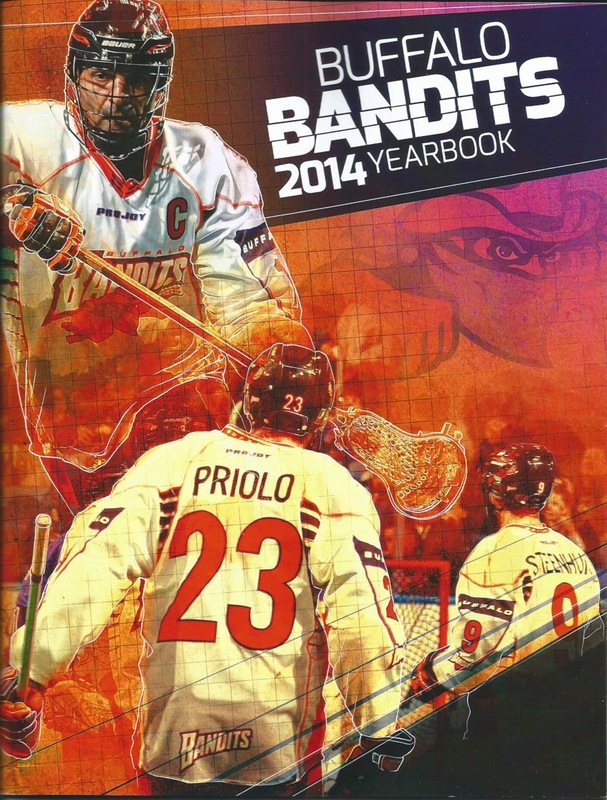 That meant starting the season in 2013, and the Bandits did that with a home game against Philadelphia. The Wings weren't supposed to have much talent, but they put up 17 goals on Buffalo in a relatively easy win. In fact, the Bandits trailed, 16-9, until they put on a late, meaningless burst to lose by four. ("To be quite frank, we were terrible today," Cordingley said.) It was their seventh straight loss over two seasons in the First Niagara Center. Suddenly, the Bandits were off and running. Two days later, they went into Philadelphia and knocked off the Wings, 12-11, with Tavares scoring the overtime goal. Buffalo's trip in Denver the following weekend went even better, a 16-9 romp over a Colorado Mammoth team that was struggling and would soon change coaches. That set up the biggest test of the season to date, as Rochester came to town on Jan. 25. 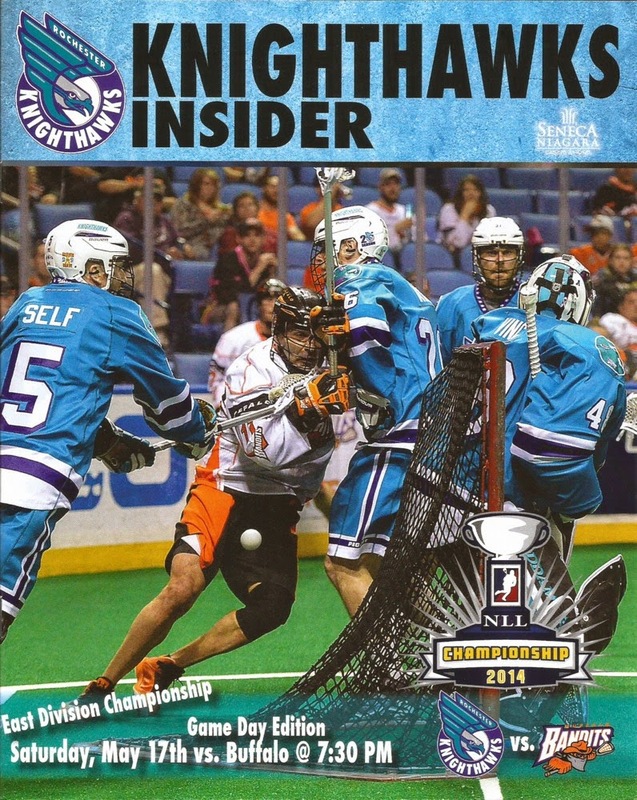 The Knighthawks had won the last two championships, and figured to be in the hunt for a third. For three quarters, the Bandits played some of their best lacrosse of the season. Goalie Anthony Cosmo had a fabulous night. His team jumped out to a stunning 10-3 lead after three quarters, then had to hang on as the Knighthawks scored five goals in the final four minutes. Buffalo's 11-10 win moved the team to 4-1 on the season, and added another win the next week over Toronto by scoring three straight goals in the final period to pull out a 12-10 decision. Steenhuis had four goals and two assists in leading Bufffalo to its fifth straight win, the team's longest such streak since 2009. The Knighthawks figured to be in a nasty mood when the Bandits arrived on Feb. 8, and that proved to be the case. Buffalo did not score a single goal in the first half. That had only happened one other time in team history; Rochester goalie Matt Vinc also was in the nets for that one while playing for Orlando in 2010. The Bandits scored four straight goals in the third period to get back in the game, but eventually took a 9-6 loss. It was back home for three straight home games against teams that weren't league powerhouses, and the Bandits took advantage. They outscored Philadelphia in every period in taking a 13-7 decision. Buffalo showed a finishing kick with a 4-0 fourth quarter to beat Minnesota, 12-9. In a game of runs against Colorado, the Bandits again pulled away in the final period to win, 12-9. Just past the halfway point of the season, the Bandits found themselves in first place in the East with a record of 8-2. Cosmo was considered one of the top candidates for the league's most valuable player award at that point, as he had been brilliant in those first 10 games. The veteran was enjoying the ride. "Part of being a goaltender in this league is that you live by the sword and die by the sword. You're a hero or a zero," Cosmo said. "I'm playing well now, and I'm a hero. But last year I was a zero." Yes, the schedule had been loaded with home games (seven of 10) and weak opponents, but the games still had to be won - and the Bandits won them. "We've had some guys who had down seasons last year come back and play more at the level we'd been accustomed to," Dietrich said. "We've had some guys who were young last year who continued to step forward. So we're happy so far with what we've got, but we're only 10 games in. We have the tough part of our schedule coming up." The Bandits were out to embark on a string of three straight road games, a home matchup with a fine Calgary team, three more road games, and a closing home date with Rochester. That would determine if the Bandits were for real. Two days later, Minnesota and Buffalo played a rare scoreless first period. The Bandits had a two-goal lead with 6:30 left, but the Swarm tied it in regulation and won in overtime, 10-9, on Callum Crawford's goal. 8-4. It was on to British Columbia on March 29 against lowly Vancouver, but the Stealth handled the Bandits easily, 12-8. 8-5. Buffalo came home to the First Niagara Center on April 5. It was an emotional night, as the Bandits dedicated the game to the son of Shawn Williams. Tucker came out of he hospital to see the game, and got a huge ovation when he was introduced to the crowd. But it was Calgary that had something left in the tank at the end, scoring six straight goals in the fourth quarter to win, 16-13. 8-6. Surely a game against the lowly Swarm would help, even if it was in Minnesota. Nope. The Swarm won, 10-9, on a goal by Logan Schuss with 4:37 left in a game that had another scoreless quarter. Almost unnoticed was the fact that John Tavares was a healthy scratch. While coaches had talked about having him rest up once in a while, this was the first time it had actually happened. Tavares said a few days later that it make him wonder about retirement. "I wondered about my lacrosse career," he said. "I've struggled a bit lately, and maybe that's why I didn't play. ... It puts a question in your mind. It hits you in your confidence. At 45, the writing is on the wall that you can't go on too much farther. ... I feel like I'm at the same pace the team is. I'm part of the problem." Buffalo still needed only one win to clinch second place in the division. On April 18, Toronto scored the final three goals of the game to pull away for a 13-9 win. That made it 8-8 and six straight losses, tying the franchise record. A night later, Rochester's defense held the Bandits to one goal in the first half, and four goals in the entire game. Three of the scores came on the power play. The Knighthawks took a 8-4 win, and the Bandits were 8-9 and couldn't even finish with a winning record. With the Bandits finally back home again, the same two teams that had scored 12 goals the previous week combined for 19 in the first half alone. Rochester's four-goal run in the fourth quarter proved decisive in a 16-14 win. That made it eight losses in a row, breaking the team record for consecutive losses. They had three straight losing seasons; they had never had more than one in a row before. Buffalo allowed Toronto to catch it for second place, costing the team home field in the first round of the playoffs. Individually, Benesch led the team in scoring with 78 points. Steenhuis was first in goals with 31. Tavares chipped in with 24 goals and 51 points. Resetarits had 25 goals, and had at least one in the final 12 games of the season. Cosmo's 10.77 goal-against average and .797 save percentage were his best statistics in three years with the team. The Bandits clearly needed to reverse course at playoff time, in order for the history books to be kind in describing the season. While Buffalo had gone 0-5 in April, Toronto had been 4-0 in the same time span. When the first-round playoff game was played, though, everything was flipped around. Perhaps Cordingley set the tone when he gave his pregame speech in John Tavares' home jersey, saying he wanted to see the legendary player perform in it one more time. Toronto's defense took much of the night off, allowing the Bandits to get great scoring chances from close range. Benesch capitalized on the breakdowns by scoring seven goals. The game was tied after three quarters, but this time Buffalo was ready to take possession of a game that was up for grabs. Tavares had two of his three goals in the final period, and the Bandits came away with a 15-13 lead. It was Cosmo's first career official playoff win. Cordingley always took the high road when it came to games with Toronto, saying he didn't take any extra satisfaction from beating a team that fired him. To his credit, he did that one last time when sending his old team home the summer. "There are character guys in that room (of Toronto's), and I know what they are going through," Cordingley said. "But I'm really happy for our guys." Next up were the Knighthawks, relaxed after a week off. The "best-of-three" series started in Buffalo on May 10, The game went back and forth, depending on which team was on a run. Tavares gave his team a boost along the way when he scored his signature goal, a stuff shot starting with a jump from behind the net. Still, the game was tied with 6:10 left after Tavares' third goal. Then the Bandits stepped on the gas, as Dhane Smith scored twice and Steenhuis and Tavares added insurance in a 12-8 win. If this was his last game in Buffalo, Tavares had given the fans something to remember. "I think he's 21," Cosmo said about Tavares. "I don't want him to retire. He's saying he's frustrated with his play, but he's producing when it counts." The series shifted to Rochester a week later. The first quarter featured some of the most intense indoor lacrosse seen in years, featuring eight evenly-divided goals and a ton of action. The Knighthawks continued to apply pressure from there, scoring six of the seven second-quarter goals to take a 10-5 lead at the half. The Bandits never got closer than four goals from there and lost, 13-8. Therefore, each team had a win. How was the tie broken? A "mini-game." The NLL opted to try something new in the final two rounds of the playoffs. In case of a split of the first two games, a 10-minute mini-game would immediately follow Game Two. If that didn't settle anything, it was on to sudden death. No one in the sport seemed to like the competitive aspects of the rule - anything can happen in 10 minutes - but it did give each team a home game and didn't stretch the season into June. When the mini-game began, the energy level on both sides and in the building went up three notches. Each possession became more important by the second, and every shot or pass could prove decisive. It may have been less than satisfactory as sport, but it was riveting theater. Resetarits scored with 4:38 left to give the Bandits the lead. A short time later, Derek Suddons came down on a breakaway. with plenty of time to think about what he'd do with the shot. The defenseman beat Matt Vinc, but the ball hit the goalpost and bounced high into the air and out of harm's way. It proved to be a crucial quarter of an inch. Joel McCready answered for Rochester with 2:22 to go, just when it started to look as if Buffalo would be going to the finals. Regulation time ended 1-1, so it was on to sudden-death overtime - which was almost painful to watch for everyone involved. Almost mercifully, the drama only lasted about two more minutes. Cory Vitarelli had the ball deep on the left side. The Bandits defense looked a little confused about who should pick him up, and Vitarelli charged toward the net. His open shot went just over the shoulder of Cosmo and into the top corner of the net. Game, set, match. The finish felt a little like a re-run from 2007, when John Grant Jr. scored in overtime to give Rochester the series over Buffalo in the semifinals. To come that close to a trip to the finals was heartbreaking and frustrating for the Bandits and their fans. Later, reality set in. The team had mortgaged some of its future with the acquisitions of Benesch and Rory Smith. They helped Buffalo get back into the playoffs, and the team was a shot away from playing for a championship. Still, the Bandits lost more games than they won over the course of the year, and their nucleus became a year older. Was it worth it? Perhaps. But with Tavares and perhaps Shawn Williams considering retirement and with much of the nucleus close to 30 years old or older, moving the Bandits forward in the coming years figured to be a even more difficult task.